Blame it on global warming or the El Nino, but it was cold and rainy this weekend in May, and nowhere to go. Too wet to hike, bike or golf. What else is there to do in Central Oregon? Movies and comfort food by the fire. And this may be the last opportunity to make a warm soup until Fall. Since I always have mirepoix ingredients and chicken broth in my frig, making soup is a no brainer. 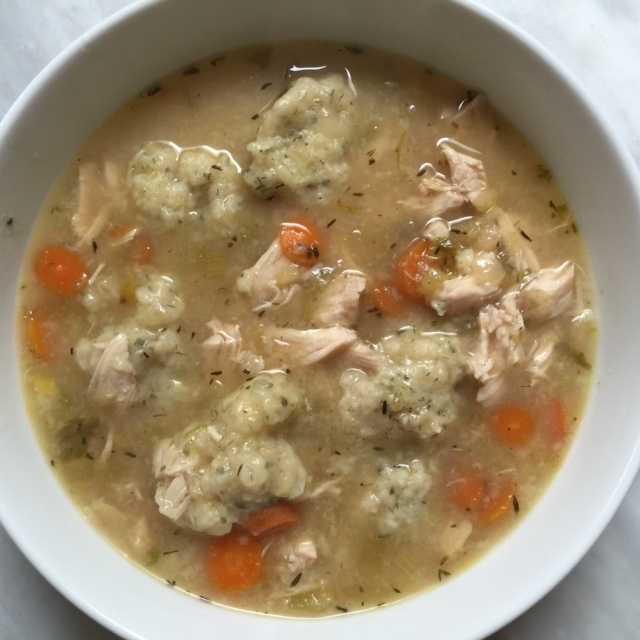 I added some herbed dumplings and salad and we had an easy and hot Chicken Soup with Herbed Dumplings for early Sunday Supper. With plenty of leftovers for another meal this week! The only way to finish off this meal with my Grandma Velma’s Wacky Cake. I watched her make this cake on the fly and remember thinking what could that old cast iron skillet produce that could be fit for dessert. 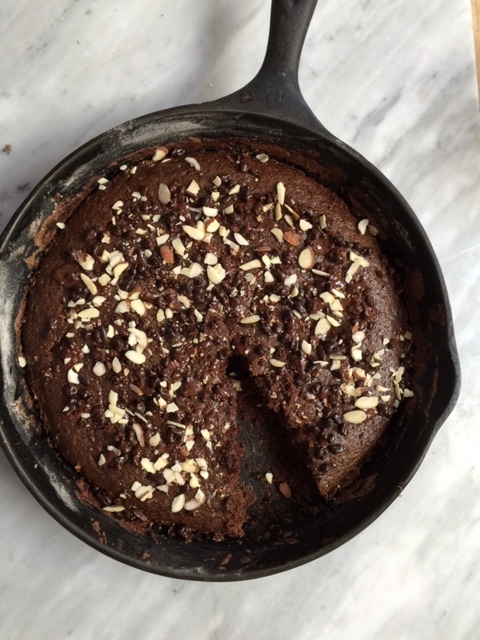 It was served very simply with confectioners’ sugar, but here I topped it with cacao nibs and toasted almonds. Preparation takes 15 minutes and another 30 mins to bake. An easy, Sunday Supper with ingredients you probably have in your pantry. Enjoy!